The work in progress for "Duet" continues on. The drawing is winding down and the canvas stretched and sized on the stretcher frame. I will get it gessoed and then start the actual painting. I am looking forward to it! In the meantime, I have very cautiously, and with consideration, ventured out of the studio a bit. There is a not-for-profit art association in Cannon Beach, which is the next town to the north of us, about 14 miles. 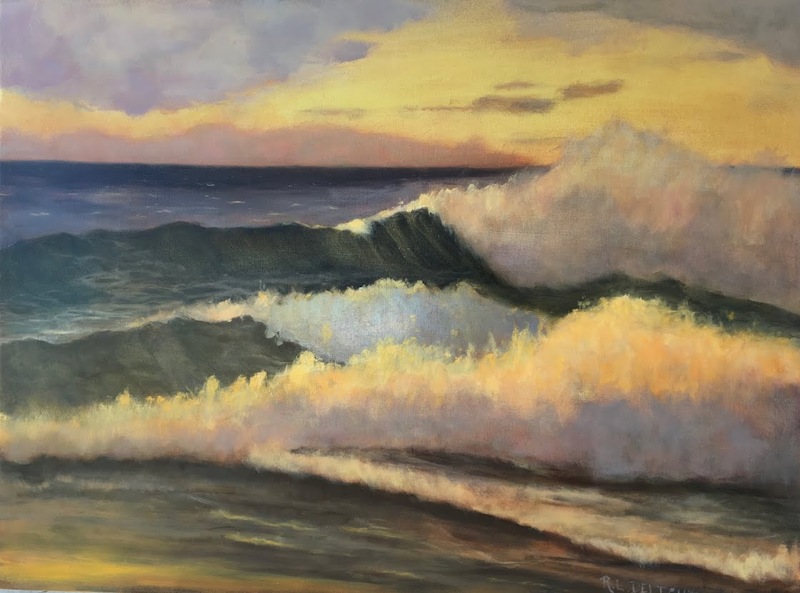 The Cannon Beach Arts Association has been around for over 25 years and is run almost completely by volunteers. I have been meaning to become part of this organization once I got settled. I like the idea of giving back and supporting my fellow artists. I recently volunteered to be a docent. Docents mind the gallery for a shift or two a month. The gallery hosts art shows and sells beautiful handcrafted jewelry, cards, and books. They fund a children's art camp and do educational outreach for art. It is a great organization to have in the area. As a docent, I have a few special artistic opportunities as well as the perks of meeting other artists, interacting with the art loving public, and a little discount if I choose to give into the temptation to purchase jewelry or art. 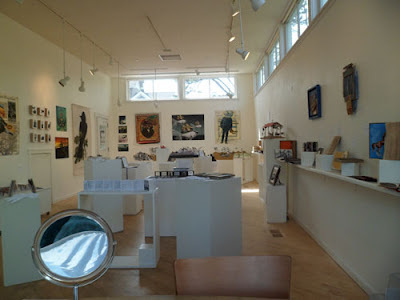 Above is a picture of the current exhibit and the lovely bright and airy gallery space. The bright space is very nice to have in our predominantly gray and cloudy climate. I plan to enter a juried show here in September. I will be posting about that painting as it happens too. In other areas of my artistic life, my wonderful handy mate has his own creative outlets, besides building me various things. He is involved with a local theater group. They are a hard working creative bunch. One of the group wrote a locally flavored musical for the players to perform and directed the play. Bob composed the music for the songs, arranged lighting for the auditorium the group is refurbishing, directed the music and performed the accompaniment for the play. They did a fantastic job. This group was a reader's theater group and have made the leap to a full fledged acting troupe. Last night was the final show and I must say, not only am I proud of them all but I appreciate the privilege of watching their creative process. They worked hard, stretched and grew. They are all a wonderful inspiration. It was amazing to watch this grow from idea to script to finished performance. I post this photo to not only let them take another bow but to illustrate another creative inspiration in my life. I also have to mention they tolerate me constantly sketching them at various gatherings! We used to go to Cannon Beach fairly often, and that gallery was my favorite. Good volunteering....I bet it will be fun.